When I was a child, it was all about the muffin for me. Blueberry, streusel-topped concoctions that resembled coffee cake; carrot muffins lubed with more oil than the transmission in our Econoline Ford van; chocolate chip-studded monstrosities that my mother used to pick up from Costco in packs of 24. I never much considered the scone until college. Likely because it didn't contain enough sugar to be a viable breakfast for my youthful self, but also because I'd never encountered a truly revelatory version. In my limited experience (that mostly revolved around the pastry case at Starbucks), scones were pedestrian. Dry. And way too adult. The kind of thing that required a good dredging into a cup of coffee (or, more accurately, frosting) to make palatable. That is until I met a certain cinnamon chip scone. There was a Great Harvest Bakery near the stadium where my cross-country team met for practice that was essentially Oz for carb-starved collegiate athletes. We'd troop in every few weeks armed with our revved up metabolisms and descend on the free samples of freshly baked wheat bread, warm chocolate chip cookies and scones like we were hibernating for the winter. Which we probably were it being Chicago and all. While we'd usually fill our carb quota around sample #5, occasionally one of us would actually buy something. Usually a cookie, but sometimes the cinnamon chip scone - an egregiously large mound of tender, butter-engorged dough streaked with crunchy nubs of cinnamon. Essentially the love child of a cinnamon roll and Southern-style biscuit, it completely obliterated all my prior misconceptions about scones as the muffin's uglier step-sister. It superseded the muffin, rendering it obsolete in my world view during the four years I spent at Northwestern and, ultimately, raising the bar on my expectation for the humble baked good. In the years since, I've become somewhat of a scone snob, arching a disdainful eyebrow at most of the bakery case blunders I come across -- usually because of their brick-like properties or because they never quite live up to the bold proclamations of their titles. Currant orange scones with a measly four currants interspersed throughout, leaden whole-wheat varieties that could double as pet rocks, and blueberry concoctions that seem confused as to whether they want to be a scone or a misshapen muffin. It's all very disheartening for a former-muffin-monogamist-turned-pastry-polygamist. Out of dire necessity (because all breakfast situations are such), I've committed myself to a life of homemade scones - first, to Molly Wizenberg's near-perfect recipe template, and, most recently to these whole-wheat raspberry ricotta behemoths. Or, for the uninitiated, the scone solution. The collusion of butter and ricotta and fresh raspberries spring the scone to new life. The ricotta enriches the dough with the fat it needs to maintain a delicate crumb, the raspberries saturate each bite with an intensity of flavor that is not usually commiserate with its four-currant Per Capita cousins, and the butter, well, the butter just makes it all worthwhile. It comes, predictably from Deb at Smitten Kitchen who addresses every potential bakery case hazard in one formidable pastry package. The dryness. The bore factor. The need for frosting or repetitive coffee-dunking. And while it is absolutely nothing like the cinnamon chip scone that first turned my head in college, it's just as significant. A breakfast game-changer. And the perfect reason to get out of bed in the morning outside of a muffin the size of your head. Notes: I did very little to change Deb's vision for these impeccable, egregiously delicious scones. I substituted low-fat ricotta for whole since I couldn't find the full-fat version at the store, and brushed the tops with melted butter and a sprinkling of turbinado sugar before baking to give them a bit of crunch and that bakery-style golden brown appearance. I also refrigerated my dough for a bit before portioning into pieces so it was easier to work with (the batter is quite sticky!). Everything else remains intact. One final word of wisdom, while you can certainly try these with strawberries, they won't integrate into the dough quite like the raspberries do, so for at least the first go-around, I recommend you make them as Deb intended - a perfect marriage of raspberries and ricotta. In a large bowl, combine both flours, baking powder, sugar, and salt. Whisk together until well integrated. Cut cold butter into pieces, and, moving quickly, use your fingertips to work into the flour mixture. Continue gently massaging into the flour until the mixture resembles a course meal and no clump of butter is larger than a pea. Stir in the raspberries, then add the ricotta and heavy cream, using a spatula to combine and form the batter into a dough. (It will be quite sticky so don't be alarmed!) Use your hands to knead the batter into an even mass, then dump out onto a piece of press and seal or nonstick wrap. Mold into a 7-inch square about 1-inch high, then wrap up and transfer to the fridge. Refrigerate for at least 30 minutes to make the dough easier to work with. While the dough is chilling preheat the oven to 425 degrees and line a baking sheet with parchment paper. Cut the chilled batter into nine even squares. Place on the prepared baking sheet, then brush with the melted butter. Sprinkle with the turbinado sugar. Bake for about 15-17 minutes or until lightly browned and the centers are set. Let them cool on the baking sheet for five minutes before using a spatula to transfer to a cooling rack. Like Deb instructs, it is best to let them set a few minutes before digging in! But they are well worth the wait. There's a monthly column in Glamour Magazine called "Hey, it's ok..." that lists peculiarities that might be considered "bad," but are actually relatively normal behaviors that the collective population might secretly admit to doing as well. Think, it's ok.... to wear a dress with stains on it to dinner because you're probably going to spill on it anyway. To believe you have a chance with Adam Levine even though his last girlfriend was a Victoria Secret model. To come home utterly stuffed from a five course dinner (with dessert) and still need a piece of chocolate before going to bed. To read the horoscope section of the paper first and only skim the article about U.S. drone strikes. To order a salad with bacon, cheddar cheese and salted peanuts and still pat yourself on the back for eating... a salad. A few weeks ago, my two girl friends and I were engaged in the ubiquitious discussion of where we were going to dinner that night. "Something healthyish," we said to narrow our options. We contemplated going vegan with quinoa and veggie bowls at Cafe Gratitude, gorging ourselves on ceviche at Picca, and slurping buckwheat noodles at Soba Sojibo on Sawtelle before ultimately deciding to go to LA's new Southern darling Hart and the Hunter for... "salads." Because clearly going to a Southern restaurant that specializes in biscuits so impregnated with butter that they crumble the moment you smear them with the housemade pimento cheese spread is the picture of healthy behavior. Especially since, you know, we were only there for the salads. And definitely not the biscuits. Nor the marinated anchovies slicked with olive oil to lay over warm country-style slices of pliant white bread. We certainly wouldn't be getting the hangar steak with escargot, mushrooms and grits so egregiously smooth they might as well be served in a cow-shaped creamer. Then again, eating a few, measly bites of steak and a biscuit that really isn't all that big, and a piece of bread with omega-3-rich anchovies and heart-healthy olive oil, is totally negated by that kale salad with huge chunks of dates and shards of cheese and whole candied pecans anyway. 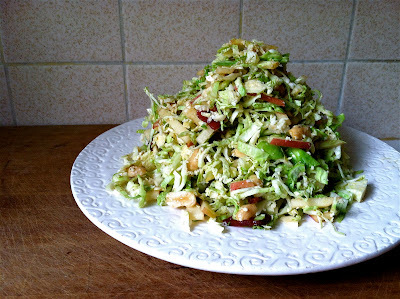 Not to mention that Brussels sprouts salad with bacon and cheddar cheese and peanuts. So you tell yourself the same thing when you decide to make it at home. That it's only one strip of bacon per serving. That the peanuts are the good kind of fat. That the cheddar cheese has calcium. That it's totally fine to scrape the sherry bacon vinaigrette you spilled onto the counter into the salad along with whatever germy substance is residing there because you don't want to waste the bacon fat. And it's most definitely, positively ok to eat the whole thing in less than five minutes using a hunk of sourdough bread to shove every last remaining shred of cheese-laced, peanut spiked, bacon-greased sprouts onto your fork. 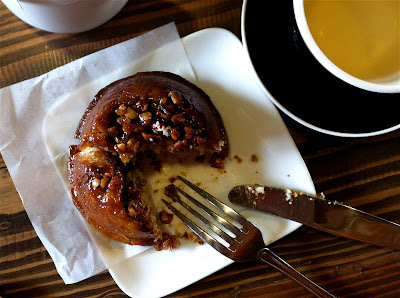 You might even decide to treat yourself to a salted caramel pecan babka after. Because, you know, all you ate was a salad for lunch. In a small bowl, whisk together the sherry vinegar, dijon mustard, maple syrup, and freshly ground pepper. Set aside. Place bacon strips in a small cast iron or nonstick pan. Turn on the heat and slowly begin cooking the bacon over low heat. When the edges start to curl up from the pan, use a fork or pair of tongs to turn the bacon and start cooking the other side. Continue turning the bacon as it cooks so that each side browns evenly. Once all the bacon is well-rendered, remove from the pan and set on a paper towel lined plate to cool and crisp up. Pour bacon grease from the pan into the bowl with the dressing. Whisk to combine. Set aside while prepping the salad. Slice the Brussels sprouts in half, length-wise. Place each half face-down on the cutting board, use a very sharp knife to slice horizontally into thin ribbons. Chop bacon into pieces. 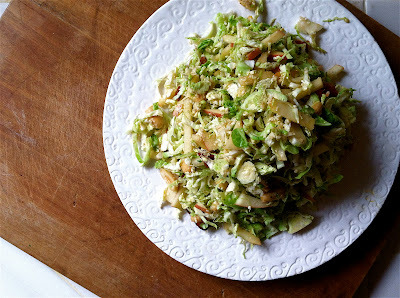 In a large bowl combine the shredded Brussels sprouts, apples, peanuts, bacon, and cheddar cheese. Toss with dressing and serve immediately, patting yourself on the back for being healthyish. When I pictured my post-graduate life while I was still in college, I saw bagels. The scenario was simple, but played out rather vividly for a girl who was still not entirely sure what she wanted to be when she grew up other than rich and ten pounds skinnier. In my head, I was living by the beach in Santa Monica in a coral Spanish-style duplex and walking down the street to get a bagel and coffee before work. I never knew the specifics of what this work was (aside from it being the type of career that would make an ocean-adjacent walk-up financially feasible), but I was always wearing something fabulous as I strolled through the dense early morning fog, the world around me still groggy. It seemed a very adult thing to do -- part of some fantastical visage of what it meant to be independent and free to make decisions like what kind of yogurt to buy at the grocery store and when to go to bed at night. As a competitive cross-country runner and compulsive reader of every book assigned to me (ie. a nerd), I'd resigned myself to a fairly structured life in college. While I loved my years at Northwestern, there were times when I resented the rigidity of my schedule -- the 6:30 a.m. workouts, the Chai-flavored Luna Bar I would scarf as I rushed, hair still damp, to make it to a 9:30 a.m. history class on the other side of campus. I longed for an existence where I made the rules. Where I could wake up and not have to immediately launch out of bed to go for a run. Where I could leisurely take a shower (or not) and nonchalantly go about my day without wondering how the amount of sleep I'd gotten the night before would impact my next race, or how I was going to finish my 15-page term paper on the Brazilian coffee trade before I left for Indiana that weekend to compete. 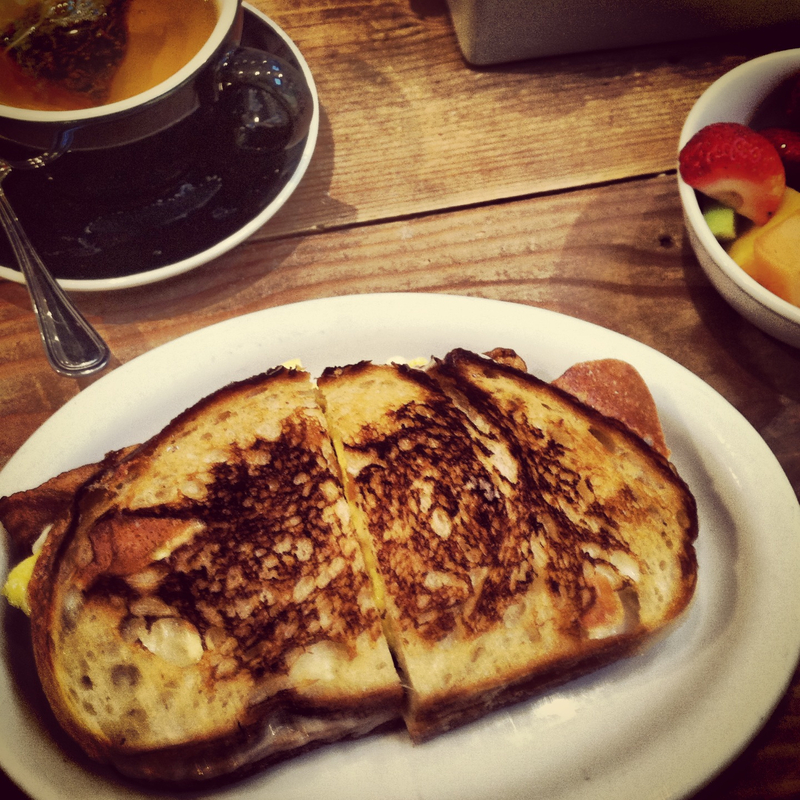 Bagels signified freedom to me -- the ability to do what I wanted to do when I wanted to do it. Which is really the whole point of growing up to begin with. Aside from, you know, being rich and well-dressed and in charge of selecting the fancy organic vanilla yogurt from Whole Foods. It never occurred to me that perhaps the rigidity of my collegiate life wasn't so much the product of external factors -- my cross-country races and class syllabus -- but rather because of my personality and innate desire to have structure. I secretly craved the stability of a schedule, and despite my wildest fantasies of creating a more fluid lifestyle for myself when I graduated, I ultimately found myself clinging to the same sort of routines in my working life that I'd considered so imprisoning during my years at Northwestern. Faced with 10+ hour days at the office, I went to sleep at a reasonable hour, peeled myself from bed at 6:00 a.m. to workout before work, and began eating oatmeal to tide me over until lunch, rarely indulging in something less responsible like the sugar-saturated Vanilla Almond Crunch I craved much less that hypothetical bagel and coffee. While it's been nearly eight years since I've graduated college, I've only gone out for breakfast twice before work. The first time because I needed to kill an hour after dropping my brother off at LAX, and the second time because I fractured my finger. When I collided finger-first into the pavement five weeks ago, I had no idea how completely it would alter the minutiae of my daily life, shattering many of the routines I'd so assiduously created for myself. Out of necessity, I was forced to slow down. To walk to the gym instead of running there. To skip workouts. To take longer showers. To type out my email responses to friends with one hand. Two weeks ago, I woke up and decided, rather spontaneously, to walk to Joan's on Third, my favorite local cafe, for breakfast. 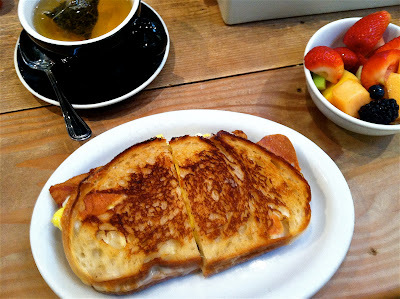 I ordered a NY Breakfast Sandwich with eggs, bacon and jack cheese; and a pot of Jasmine tea -- my grown up version of a nutritionally suspect bagel and coffee -- and sat at the communal table to take a moment to live outside of my standard set schedule. I read the paper, actually turning to page 7A to finish the rest of the story. I savored the crunch of the toasted white bread as it gave way to the pillowy eggs and melted cheese, slicked with residual grease from the well-rendered bacon. And I inhaled the aroma of the awakening cafe -- the cooks lining up veggie and quinoa salads in the display case in preparation for the lunch rush, the expressive silver-haired man sipping his black coffee and carefully cutting his plain omelet into precise bites, the soundtrack of sizzling butter hitting the hot grill. Leaving Joan's a half hour later, I spotted two girls walking down the street in Lululemon pants, a telltale sign that they had just finished a workout at the Bar Method studio down the block. The irony wasn't lost on me -- if my finger hadn't been broken, if I hadn't been forced to pause, I would have been working out with them rather than enjoying a leisurely self-indulgent breakfast. This recipe, inspired by that NY Breakfast Sandwich at Joan's, is perfected through patience. While grilled cheese-style sandwiches are usually thought of as a quick meal, here, the key is slowing down. 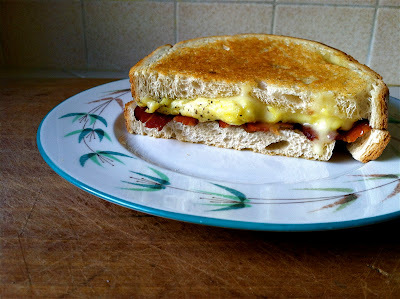 Gradually cooking the bacon until perfectly rendered, and studiously grilling each side of the sandwich until the cheese oozes over the edges of the egg and the bread is evenly browned and crisp. The result is everything you imagined it to be in all your wildest dreams. With or without a cup of coffee. Place bacon strips in a large nonstick pan. Turn on the heat and slowly begin cooking the bacon over low heat. When the edges start to curl up from the pan, use a fork or pair of tongs to turn the bacon and start cooking the other side. Continue turning the bacon as it cooks so that each side browns evenly. Once all the bacon is well-rendered, remove from the pan and set on a paper towel lined plate to cool and crisp up. Crack eggs in a large bowl. Add the milk, salt and pepper to taste, and whisk together until the yolks and whites are combined. Heat a cast iron or nonstick pan over medium heat. Add a teaspoon or so of butter, swirling to coat the base of the pan. Once the butter begins to foam and bubble, add the eggs and let sit for a minute or so. Using a spatula, gently push the edge toward the center of the pan, letting the runny egg run out to cook, then fold the eggs into a somewhat neat package, approximately the same shape as your bread. Flip over to ensure the eggs are cooked through, and then remove from the heat. Lay the four strips of bacon on one piece of the bread. 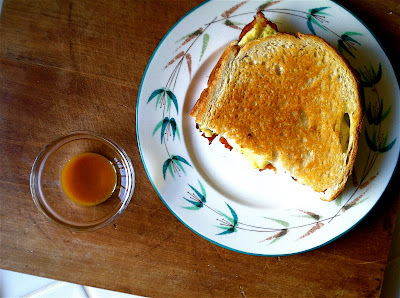 Top with the egg, then sprinkle with the grated cheddar or jack cheese (grating the cheese melts better than slices). Finish with the other piece of bread, spreading a thin layer of butter over the exterior of the bread. Heat the clean large nonstick pan (perhaps the one you used to cook the bacon or eggs) over low to medium-low heat. Carefully place the sandwich, butter side down, in the middle of the pan. Butter the top slice of bread while the other side cooks slowly for 5-10 minutes until it achieves a deep golden brown crispy exterior. Use a large spatula to gingerly flip the sandwich over to cook the other side, again for another 5-10 minutes. Briefly flip the sandwich back to the other side to reheat for 30 seconds and then remove from the pan. Slice in half and serve immediately with optional hot sauce.